After an unexpected redundancy, Ruby begins to question her priorities. Inspired by a quote from Kahil Gibran about loving your work, she launches her mission to find the ideal job. Her year of gainful (and sometimes painful!) employment includes nannying for clients in the South of France; dealing with embarrassing ailments in a Harley Street clinic; waiting tables in a buzzy Soho café; and meeting the celebs of years gone by in a home for retired actors. And even though love is no longer top of her list, relationships just seem to start happening along the way – which sees her handing out some P45s of her own! But will any of the jobs, or men she meets, see her dreams come true? Or will Ruby just end up back where she started? On the fun front cover of this book there is a quote from Miranda Dickinson which I whole heartedly agree with: ‘The kind of special book that only comes along once in a while’. I took this novel by Nicola May with me on holiday in Cornwall and thoroughly enjoyed it. 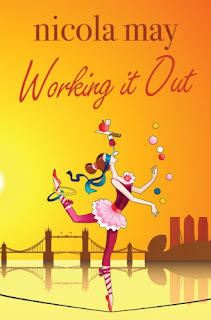 Nicola May has written a fun, entertaining book that kept me absorbed from start to finish. Due to my M.E my concentration levels aren’t what they used to be, and I often find myself staring into space when I’m supposed to be reading, but this is so well written it kept my attention throughout. The idea of trying twelve different jobs in a year gave this book a great plot and structure for the story to steadily build around. As Ruby tries different jobs, we are introduced to more fantastic characters whose lives intertwine with each other. The characters aren’t perfect, including Ruby, which makes them much believable and easy to relate to. Not only are there some fantastic character is this book, there are some really cute animals too – Patrick, Ruby’s faithful old cat, Ben the clever Guide Dog and Montgomery a sweet terrier. The jobs Ruby tries throughout the year range from waiting tables to working at an undertakers – you never know what she’s going to try next! Whilst Ruby has a plan to sort out her working life, she’s not so organised when it comes to her love life. There's gorgeous George, her neighbour who she could spend all day flirting with and Bentley the millionaire who is fun but not for the long term and several more men that she meets along the way. Which job (and man) is the one for Ruby? There were moments in the book that literally made me laugh out loud, and others that brought a tear to my eye. I really enjoyed Nicola May’s writing style, the story flowed well and she created some great, well-rounded characters that you really believed in and routed for. I thoroughly recommend ‘Working it Out’ and can’t wait for her next book.